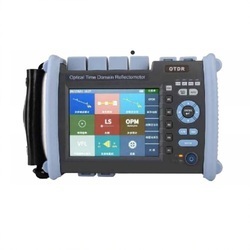 Automatic Measurement Mode: Only by selecting the measurement wavelength, the measurement parameters are automatically set, and the trace data is automatically saved and automatically analyzed. Multi-wavelength Measurement Mode: In the parameter setting, the wavelength can be automatically switched into the multi-wavelength measurement mode. Under this mode, the analysis can be achieved on the attenuation state of the same fiber section under different wavelengths. 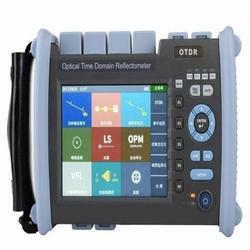 Trace Fixing Function: It can achieve the same-screen comparison and display of one trace with another real-timetrace or the trace under the average measurement, which is very useful for the installation of multi-core fiber orthe checking of the aged fiber in the optical fiber network already been installed. Multi-wavelength Analysis Function: It can achieve the comparison, display and analysis functions of any trace file. FTTx online testing, able to identify the splitter and the fiber’s end. Large-capacity lithium-ion rechargeable battery, with the long standby time over 12 hours. 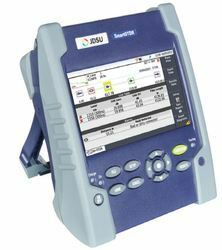 The lightweight and compact SmartOTDR solution performsall essential fiber tests for metro and access networks with:OTDR measurements• Fiber inspection with automated end-face analysis• Optical loss testing (optical light source and optical powermeter)• Visual fault locationWith a tailored interface for different skill levels, it speedsand optimizes field testing for any technician. 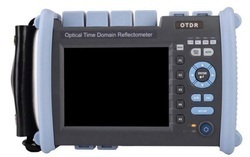 Looking for Optical Time Domain Reflectometer ?